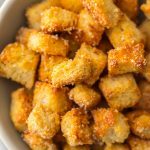 If you want homemade croutons in your life (and you do), Homemade Garlic Parmesan Croutons are THE choice. They are crispy, yet tender, with a hint of garlic and the perfect amount of Parmesan. They aren’t only great on salad, they make a terrific snack. Did you notice I said “with a hint of garlic”? 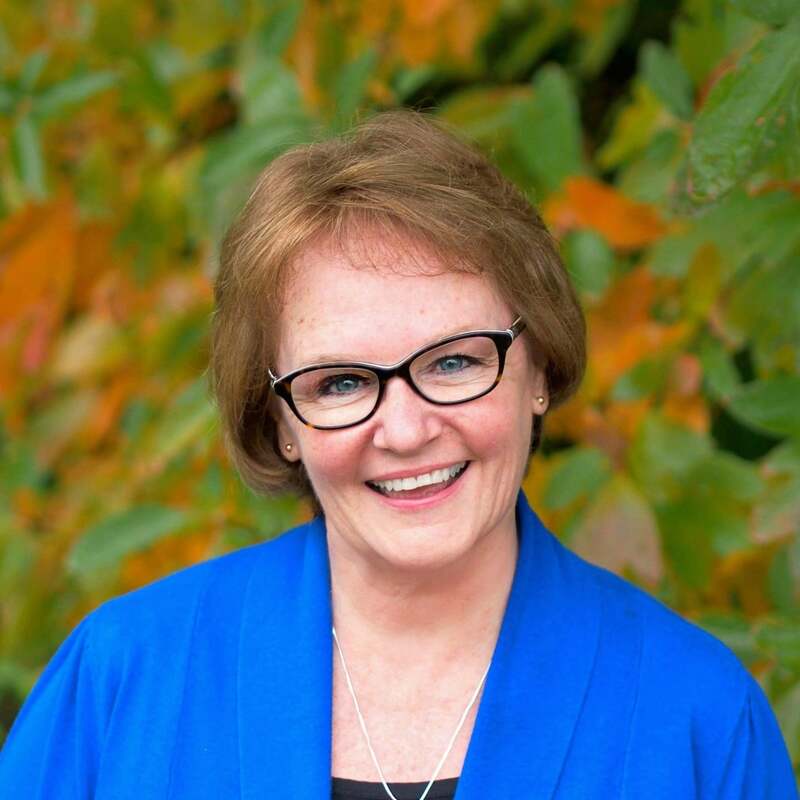 I like garlic – I don’t LOVE it like so many people do, but I LIKE it…just like I like Sally Fields. I guess what I don’t love is an overpowering garlic taste in any food. I LOVE these croutons partly because the garlic is nuanced due to a method attributed to Julia Child. When you read this recipe, you might be tempted to skip the part about infusing the oil with the garlic instead of just adding minced garlic to the bread. Please don’t. You see, garlic browns faster than bread, so you would end up with dark brown & bitter garlic bits on otherwise fabulous croutons. See what I mean? Gentle, reflective garlic is one hundred times better than “sock-it-to-me garlic”. 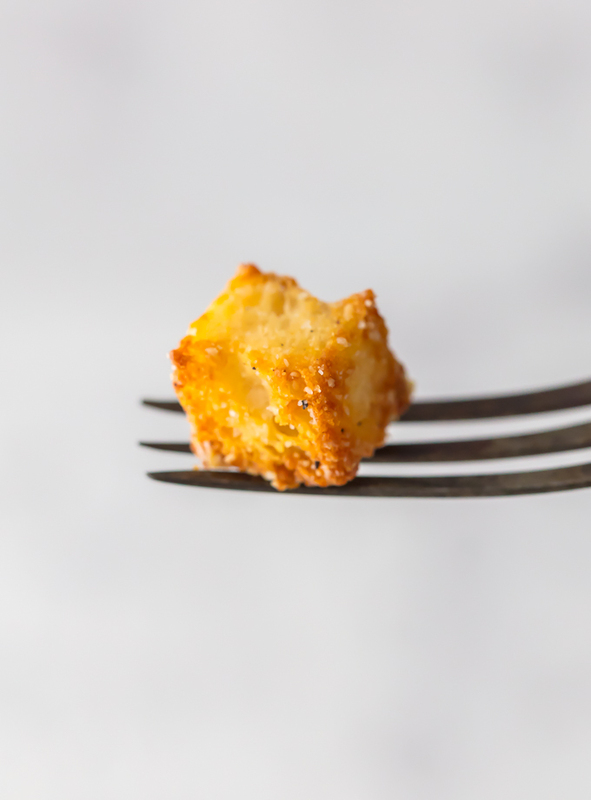 These croutons are the perfect baked croutons. Easy – check! Crispy – check! Tender – check! Versatile – check! Balanced flavors – check! Low-fat – check! Delicious – check! Perfect – check! My husband, Jeff, loves salty snacks, but downing half a bag of tortilla chips, in one sitting, every afternoon before supper, isn’t the wisest of choices. Eating three cups of Homemade Garlic Parmesan Croutons isn’t a wise choice either, but one-half cup — not so bad. I do what I can to help. I hide them. He leaves me no choice. I’m not judging him; I’m empathizing. I have my own vices, one of which I will be sharing on Simply Sated in the near future. 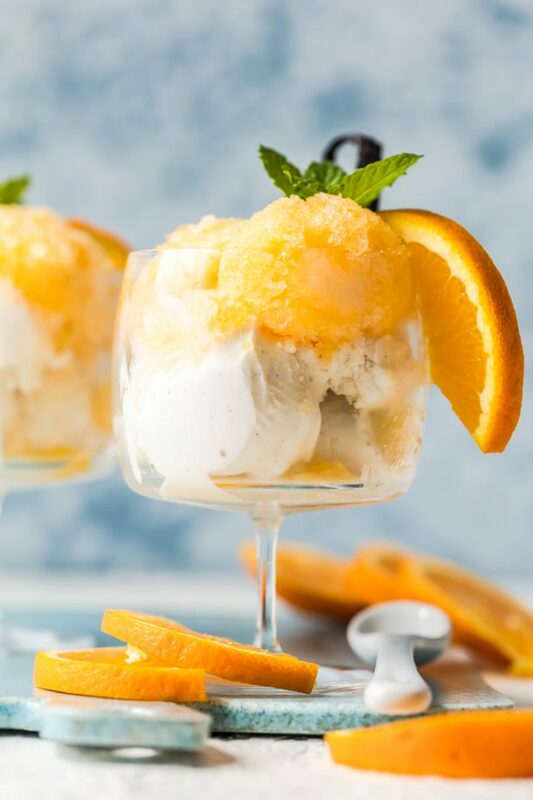 Let’s just say after one bite of a certain dessert, you will hear angels singing the Hallelujah Chorus. With two bites, you will be singing and swaying right along with them. 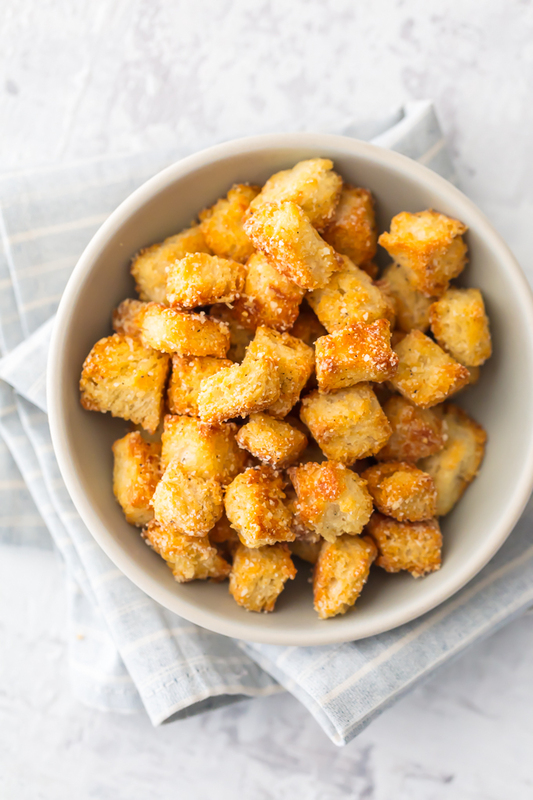 As I said earlier in this post, you want these Homemade Garlic Parmesan Croutons in your life. Jeff loves them in his, but he’s selfish. I have jolted myself awake, out of a restless sleep, screaming “Save the croutons for the salad!” I decided to solve this problem by buying a safe and storing my crouton stash inside. I’ll hide the combination in the candy jar. He will never look there. Enjoy, as much as Jeff does! Thank you Becky Gall, aka: The Cookie Rookie for creating more of you gorgeous food photography. Please check out some her most recent recipes – you will be pleased. 40 Clove Chicken and Potatoes with Cream Sauce (The garlic in this recipe is still nuanced – you have to try it to believe it.) These Baked Sticky Sesame Wings are amazing! 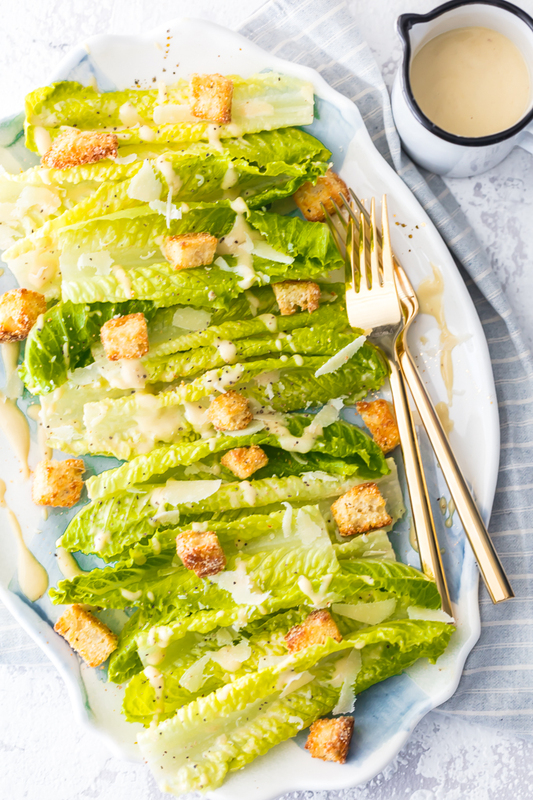 …a little side note: Julia Child is credited with making Caesar Salad famous by sharing the recipe in her cookbook Julia and Jacques Cooking At Home. More about that tomorrow when I share my Classic Caesar Salad recipe. 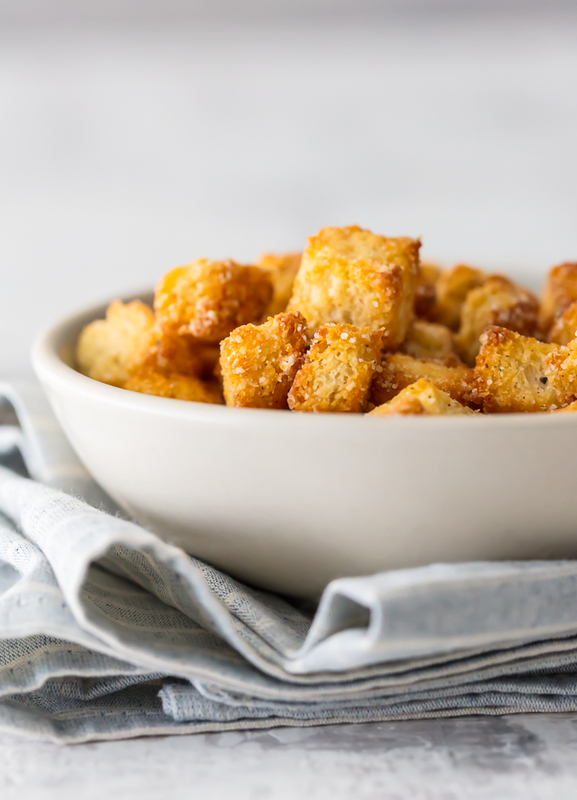 If you want homemade croutons in your life (and you do), Homemade Garlic Parmesan Croutons are THE choice. They are crispy, yet tender, with a hint of garlic and the perfect amount of Parmesan. They aren't only great on salad, they make a terrific snack. Place oven rack to middle position, and heat oven to 375°F. In a small bowl, whisk olive oil with minced garlic for 30 seconds. Pour the olive oil/garlic mixture through a fine mesh strainer set over a large bowl. Press the garlic with a rubber spatula or the back of a wooden spoon to extract as much garlic oil as possible. Reserve the garlic for another use. Microwave the butter, in a small bowl, at 30% power for 20-40 seconds. The butter could bubbly over, so watch closely the last 10 seconds. Add the oil to the melted butter and stir well. Add the salts, black pepper, your favorite herbs/seasonings to the butter/oil mixture and add the bread cubes. Toss until cubes are evenly coated in the oil/butter mixture. 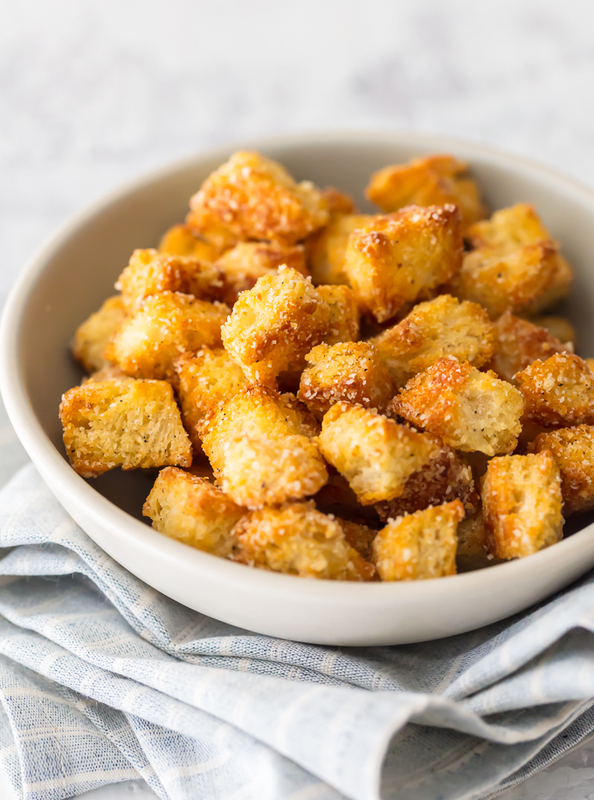 Pour the croutons onto a foil-lined rimmed baking sheet and bake 15-25 minutes, stirring and flipping after 8 minutes. Bake until golden brown and crisp. 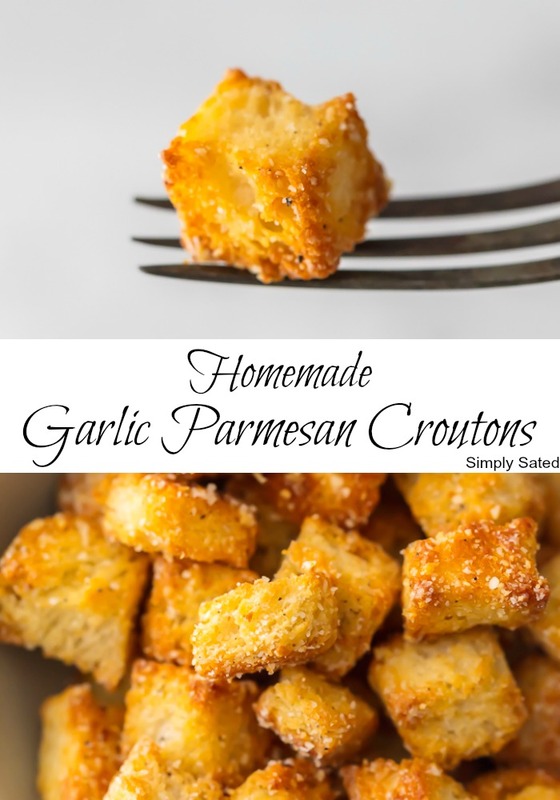 Sprinkle with the grated Parmesan cheese and toss until all croutons are covered. 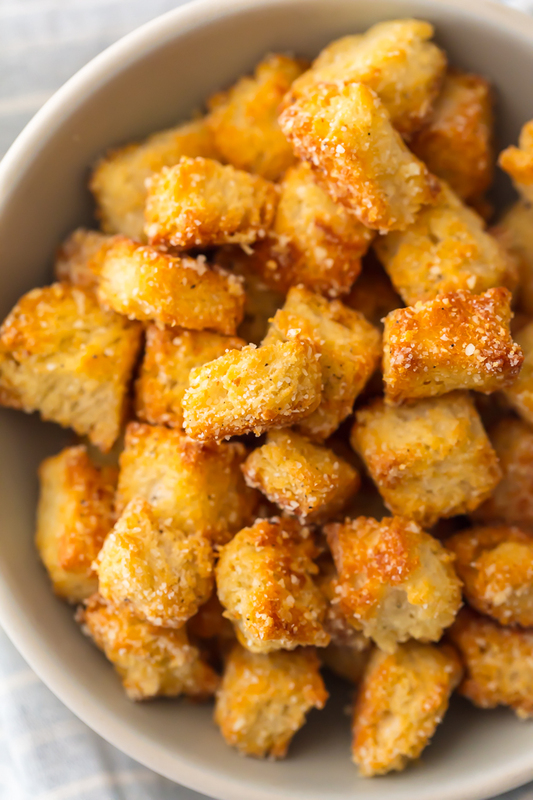 The croutons will keep in an airtight container up to 3 weeks, but I promise you they won't last that long.